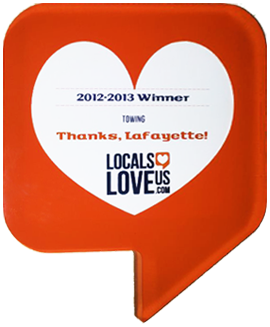 What do you do if your Car is Towed in Louisiana? Tow trucks are deceptively strong. Even the light duty trucks are able to pick up and tow practically any commuter vehicle with ease. Large pickup trucks don’t stand a chance against a basic tow truck. Medium duty trucks are strong enough to handle most residential vehicles and plenty of commercial ones too. This includes buses, box trucks, motorhomes and RVs, and other large vehicles. So when do you need heavy duty towing? Industrial vehicles and heavy commercial vehicles can break down too. That’s where heavy duty tow trucks come in. A quality towing company needs to not only be ready for routine pickups, but vehicle recovery for these kinds of vehicles too. Some important equipment to have on hand are heavy duty crane systems and winches, undercarriage wheel lifts, and air cushion recovery. What happens if the vehicle that’s broken down is larger than any tow truck? While it might seem like all is lost, the equipment on heavy-duty tow trucks may surprise you. How much can a crane lift? A crane’s rating refers to how much it can lift. There are cranes of all sizes available, from a couple of tons all the way to 20,000 metric tons. That’s over 40 million pounds! 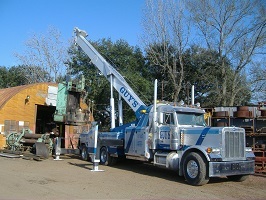 In comparison, heavy duty tow trucks usually carry a crane rated for somewhere between 20 and 80 tons. Is that enough for a semi truck? Legally, the heaviest that a semi truck can be with its cargo for bridge crossings is 80,000 pounds, or 40 standard tons. 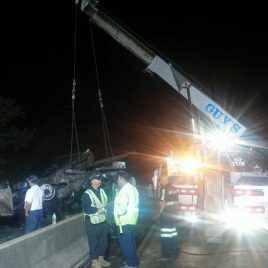 This means that a heavy duty tow truck with a 60-ton crane system is powerful enough to lift the semi if needed with plenty to spare. Accidents on bridges can be dangerous. In rare cases, vehicles end up underwater from one of these accidents. And if a car is in ten feet of water, all must be lost, right? Wrong. A high-rated crane system can pick up not just residential cars, but semi trucks too. In some parts of the country, underwater recovery isn’t especially unusual. When lakes freeze over during the year, some people take the risk of driving their vehicle on them and assuming the ice will hold. If a smaller vehicle couldn’t handle going on the ice, a hefty tow truck couldn’t stand a chance. 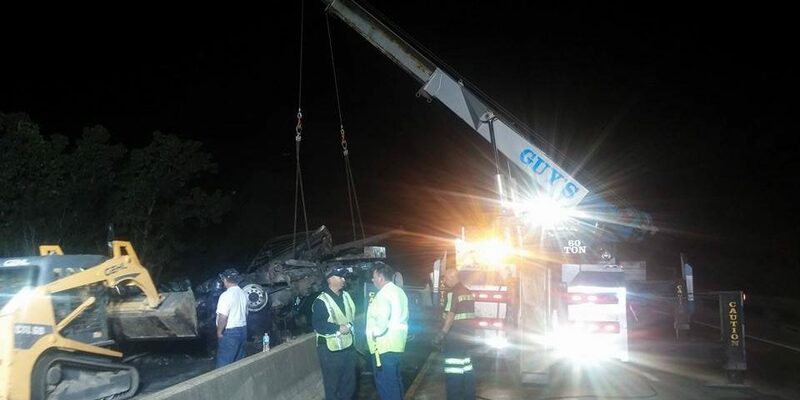 Instead, a winch and crane system are used for vehicle recovery. Underwater recoveries are unique in that they require a diver to enter the water to properly hook up the vehicle to the crane. Then the winch slowly retracts while the crane lifts the vehicle out of the water. Cars and semi-trucks aren’t the only vehicles that heavy duty tow trucks can help with. Industrial equipment such as farm vehicles and construction equipment can break down too. And if a construction vehicle is putting together an office building, you wouldn’t want it to be stuck right by your business forever! Fortunately, the right heavy duty tow truck can help with these too. Bulldozers, drivable cranes, tractors, and much more can be towed with the right heavy duty equipment and techniques. There have even been times when full-size jetliners have been towed for repair by these trucks! Some tow truck companies try to treat large vehicles the same as sedans. This is often a costly and avoidable mistake. By investing in proper equipment, towing companies can save their customers hundreds or even thousands of dollars–and save themselves from unfavorable reviews. Towing is often done one of two ways; either by moving the car to a flatbed trailer or by using a tow bar or wheel lift. While lifting the front two wheels is enough for most typical four-wheeled vehicles, what about longer vehicles? Or what if they have more wheels? A more specialized undercarriage lift is sometimes needed. Using this equipment and finding the ideal attachment point greatly reduces the chance that a larger vehicle will be damaged in the towing process. One type of recovery that’s gaining headway is airbag recovery. Instead of barreling through and free lifting an overturned semi truck with a crane, a much easier–and safer– approach is to use air bags. These special lifting bags are made of durable synthetic fiber that won’t tear or pop. These fibers are expandable and pump up using pressurized air. Because of their durability, even fully-loaded semi trucks won’t make them pop. Instead, the bags fill with air until they are able to push the semi up and make it upright once more. Properly using air cushions requires extensive planning beforehand. Generally, there are two types of air cushions used in a job; the lifting bag that lifts the vehicle off of the bag, and the landing bag that keeps the vehicle stable so it doesn’t tip over again. The landing bags are strategically placed to stabilize the vehicle and are filled to a certain level while the lifting bags continually pump up until the vehicle is righted. Since these are used primarily for overturned vehicles, once the lifting bag right the vehicle, there’s no longer anything on top of it meaning that it can be deflated at will without the risk of flipping over the vehicle once more. 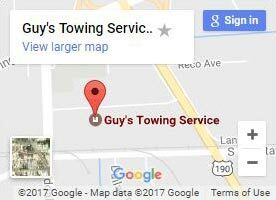 Instead of making the customer decide which truck is right for their situation, tow truck companies tend to take the details of your situation and send the appropriate truck based on what you tell them. This means that even if you have no knowledge of the towing industry, the professionals can tell quickly that your light-duty pickup truck that won’t start isn’t going to require all the equipment of a heavy duty tow truck. But if you ever do need to use this specialized equipment, make sure to choose a towing company that has you covered!